We are preparing for the 10th Jubilee of the Technology Transfer in Diagnostic Pathology Central European Regional Meeting series. 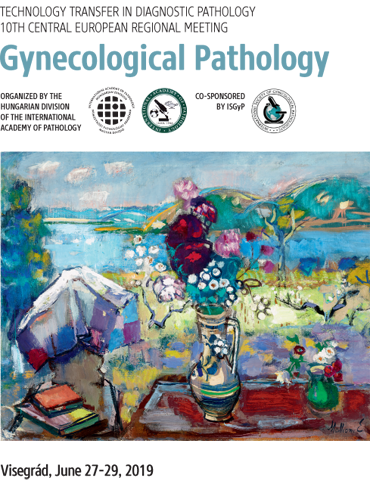 We would like to celebrate this important jubilee by outstanding scientific content in the field of Gynecological Pathology, but our aim is to make this event a little bit more special than the former nine meetings were. On the hillside above Visegrád, the hotel offers a breath-taking view of the Danube Bend, with an undisturbed natural environment, quiet surroundings and excellent conference and wellness services. Visegrád is further linked to the so called 'Visegrád Four' or V4, which is the alliance of the Czech Republic, Hungary, Poland and Slovakia. The Group was formed in Visegrád on February 15, 1991, with the aim to intensify mutual co-operation and friendship between the four states. To obtain further information please fill in the form below. By fill in this form you can not register to the congress. If you would like to register please click here. Attendance Certificates will be issued by the Congress Secretariat upon registration. The Meeting was submitted for accreditation by EACCME and the Hungarian Medical Association. Abstracts for poster presentation only can be submitted via the online submission form, maximum 1,200 characters of text (excluding name and affiliation). Abstracts received after the deadline will not be considered. The decision of the Abstract Evaluation Committee will be forwarded to the author by e-mail until May 15, 2019. Presenting authors must register and pay the registration fee. Title: maximum of 100 characters, do not use capital letters. All abstracts should be written in English Abstracts will be published in the Final Program. Submission implies consent to the publication. Posters will be displayed in touch screens. More information soon. Reservation can be made via the congress website. Reservations will be made on a „first come - first serve” basis against full payment. after April 30, 2019 no refund. Refund requests must be submitted to the Conference Secretariat in writing on or April 30, 2019. The weather in June is usually warm in Hungary, temperature ranges between 20-24 ℃. June is also Hungary's rainiest month.